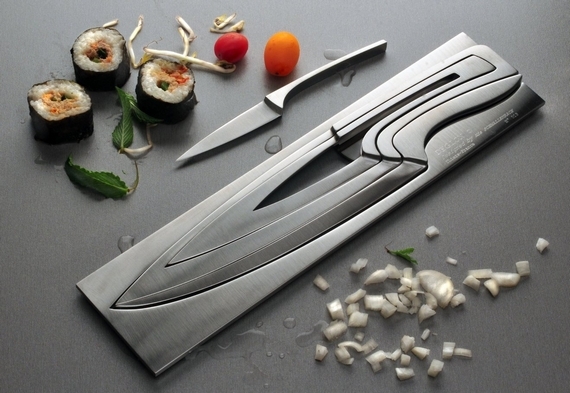 Designed by Mia Schmallenbach for Deglon, the Deglon Meeting Knife Set won first prize at the 5th European Cutlery Design Award, this nesting knife set takes kitchen cutlery to a whole new level. Looking at this set of knives it looks sleek and stylish but also a little scary with the sharp edges and points of the knives all set into each other. As well as looking the part they also have a sort of puzzle and intrigue about them when it comes to putting them back, which you do carefully and delicately. Constructed from a high-quality stainless steel the entire set looks stunning. 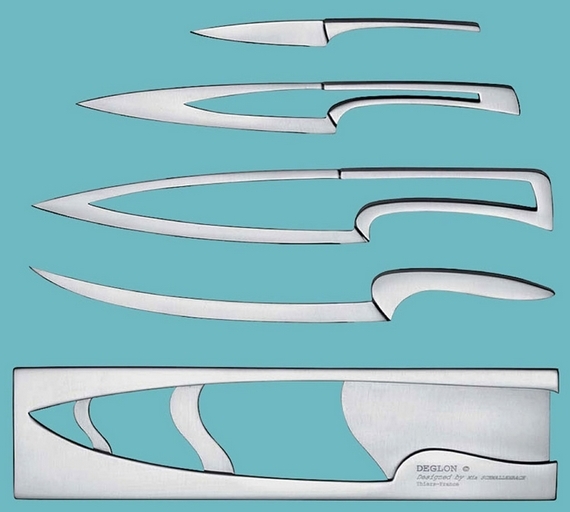 Nested one inside the next, the solid stainless steel set contains 3.25-inch paring knife, a 4.25-inch utility knife, an 8-inch chef’s knife, and an 8.75-inch slicer, each slotted within the other, all set inside a solid stainless steel rectangle base/case. When all nested they look like a stylish plaque that should be on the wall, or some sort of trophy, they really do look stunning and very eye catching. Although they would look great on a wall they must be laid flat on your work top or in a drawer to ensure the knives don’t slip out, with them all being nested it would be a disaster waiting to happen! With them being nested it makes them great for kitchens where space is a premium, their space saving design means there is no need for a large clunky knife block, or them taking up large amounts of space in your drawer. To remove a knife from the set, simply press down near the tip of the blade which will told the knife and handle upwards allowing you to grip. Then just lift it up from the other end. The way they are displayed makes them an ideal gift for people that love to cook and like their design. The Deglon Meeting Knife Set is a beautiful design and certainly looks the part, with design and style like this they don’t come cheap with a price tag of over $600.